Driving near or next to a giant tractor-trailer can make some drivers more cautious or defensive in their habits. 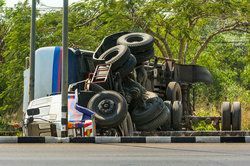 Although most trucks and their drivers are perfectly safe, responsible denizens of the road, truck accidents are undoubtedly some of the most dangerous auto accidents possible. Simply veering off the road or colliding into a nearby car is bad enough, but even greater injuries or death may be sustained when the truck loses control completely. Such is the case with a jackknife accident. Drivers in Brooklyn and the surrounding metro areas may benefit from understanding the potential dangers of a jackknife truck accident, encouraging them to drive safely around trucks and notice the warning signs of a potential jackknife accident. If you or a loved one have already suffered the consequences of a negligent truck driver, our personal injury attorneys are prepared to investigate your case. A jackknife accident occurs when a tractor-trailer or similar vehicle loses control, swerving in a way that swings the trailer around toward the front, closing in on itself. If you can picture how a jackknife (or pocket knife) begins straight before folding into an acute angle, this is a good representation of how such an accident looks. Once a truck begins to fold in this way, the driver has almost assuredly lost control of the vehicle. In fact, many trucks lock in place once the trailer swings around to such an extent, leaving the truck driver and other nearby drivers little choice in where to go or how to react. As soon as you begin to see a truck swerve, swing, or display any erratic movements, it is definitely a good idea to get as far away as possible. In general, it is a good idea to avoid driving directly next to a truck unless you are passing it, and this is doubly true around curves or intersections. If you have sustained injuries from a jackknife accident, our attorneys will gladly help you build a case against the negligent driver or party. In some cases, such accidents may simply be due to a fatigued, distracted driver, or inattentive driver. In other instances, however, jackknife accidents are the cause of malfunctioning parts that result in brake failure or axles suddenly locking up. Depending on the circumstances, fault may be placed on the driver, trucking company, mechanic, or vehicle manufacturer. Each of these cases requires different evidence and will result in different trial stipulations. By examining the accident’s repercussions, consulting experts, perusing official reports, and speaking with witnesses, we can mount a solid case as to who is truly responsible for your accident. If your case is successful, you can gain compensation for any and all damages incurred. This includes expenses such as medical bills, vehicle repair, lost wages from work, general pain and suffering, and funeral costs (if applicable). You may not have been able to prevent your accident, but you can prevent its financial consequences from continuing to take a toll on your life. Call or email our office today to learn more about how we can get you fairly compensated for your injuries.